The truth isn’t what it seems in this stirring novel of suspense. SYNOPSIS: After presenting a major scientific breakthrough to a rapt audience across the country, renowned astronomer Sarah Mayfield returns home to a disturbing discovery. Her husband, Ben, a Los Angeles restaurateur, has disappeared, leaving behind an unexplained bank deposit of a million dollars, a loaded Glock in the nightstand, and a video security system that’s been wiped clean. The only answers their son, Zack, can offer are the last words his father said to him: keep the doors locked and set the alarm. Sarah’s marriage was more troubled than anyone suspected, but now she is afraid that her husband’s recent past could be darker than she dares to admit. Suspecting that nothing about Ben’s vanishing is what it seems, Sarah must delve into the space between old memories, newfound fears, and misleading clues to piece together the mystery of her husband’s disappearance—and find what she hopes in her heart is the truth. 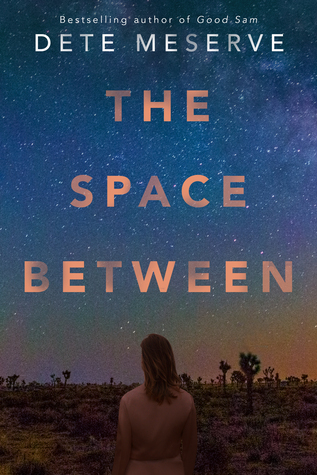 The Space Between was a good mystery/thriller, but not a great one. I did enjoy the story and the astronomy tidbits thrown in here and there were interesting and fit in well. The characters fell a little flat for me, however, and I had a hard time relating to Sarah for some reason. Overall it was a quick and enjoyable read though, so I would definitely give Dete Meserve another try. Nice, honest review Erika. It is tough to enjoy a book when you can’t relate to the characters, especially when they don’t seem real.